A new multi-author book offers valuable insights into the importance of independent media for democratic governance in the wider South Asian region. 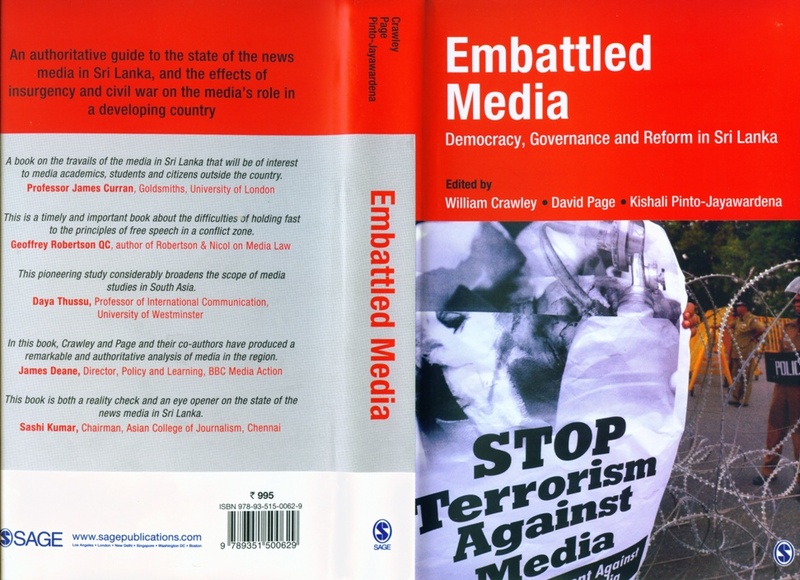 Titled Embattled Media: Democracy, Governance and Reform in Sri Lanka (Sage, Feb 2015; 416 pages), the book examines the role of the media in a state committed to democracy and the rule of law which had suffered extraordinary stresses as a result of ethnic strife, insurrection and civil war. The book is co-edited by William Crawley and David Page, both fellows of Institute of Commonwealth Studies, University of London, UK, and Kishali Pinto-Jayawardena, a legal analyst on civil liberties and columnist with The Sunday Times newspaper in Sri Lanka. According to its publishers, Sage Publications in India and the UK, the book is an ‘authoritative guide to the state of the news media in Sri Lanka, and the effects of insurgency and civil war on the media’s role in a developing country’. This is the first book to look comprehensively at the evolution of news media in post-colonial Sri Lanka, with a focus on media policy, law and education. The book reviews the role of new media platforms in widening the scope for public debate. Further, it provides a detailed analysis of the existing media laws and policies and of campaigns to reform them. It also focuses on the role of institutions in media education by providing a comprehensive analysis of existing media curricula and underlining the importance of improved media literacy and introduction of Right to Information Act for a healthy democracy. The contributors to this volume, including leading journalists, broadcasters, practitioners in public law, media academics and analysts, write from extensive experience. Chapters have been written by: Sinha Ratnatunga, Ameen Izzadeen, Namini Wijedasa, Amal Jayasinghe, Tilak Jayaratne and Sarath Kellapotha, Nalaka Gunawardene, Kishali Pinto-Jayawardena and Gehan Gunatilleke, Jayantha de Almeida Guneratne, and S. Raguram. The book is dedicated to the memory of the late Tilak Jayaratne (1943-2013), who ‘ably represented a generation of honourable and committed broadcasters’. Having contributed significantly to the book, he did not live to see its publication. In their preface to the book, the co-editors write: “Media liberalisation from the 1990s onwards had extended the range of choice for viewers and listeners and created a more diverse media landscape. But the war in the north and insurrections in the south had taken their toll of media freedoms. The island had lived under a permanent state of emergency for nearly three decades. The balance of power between government, judiciary, the media and the public had been put under immense strain. The book also contains a glossary of media related terms; a bibliography and an index.